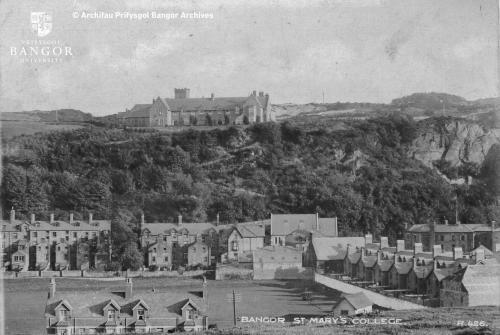 Photograph of St. Mary's College, Bangor, c.1900. The old football field, now the site of Asda, can be seen in the foreground. St Mary's College, Bangor, was built in 1893 as a Church in Wales Teacher Training College for Women. It was amalgamated with the University College of North Wales (Bangor University) in 1977. Picture published by E.T.W. Dennis & Sons Ltd.